Here at the Macworld office, a big part of our workflow revolves around keeping up with what’s hot in tech news. (Shocker, I know.) We each have our own methods to combat the madness—I’m dependent on Feedly, where I’ve got various news sites broken down into categories for me to monitor. But that’s not the only piece to the puzzle. Besides Feedly, I’m constantly keeping an eye on my Twitter and Facebook accounts to see what stories are trending. 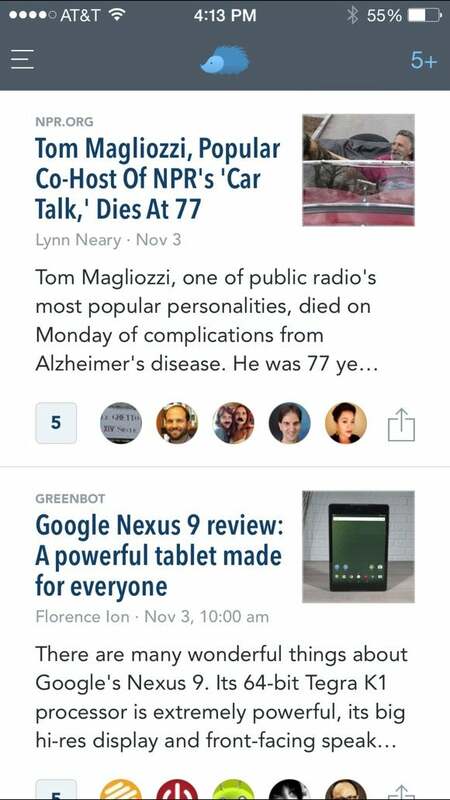 Instead of your entire social feed, Nuzzel shows you only the articles your friends are sharing. I feel like I’ve got a good system going, but I’m always looking for ways to make it better, especially on the social media front. Tweets and posts come in so rapidly that I can’t always catch every single one. Lately, I’ve been using Nuzzel to organize the articles people are posting on social media. Nuzzel collects all of the articles your friends are sharing on Facebook and Twitter, and keeps them all in one spot. That way, you won’t miss anything important, since Twitter and Facebook no longer organize your complete feed by time. Nuzzel also makes it easier for me to catch up on my reading while I’m on the go. Once you download Nuzzel, link it to your Facebook and Twitter accounts to build your feed. You can view stories based on when they were posted, or based on how many of your friends have shared a story. I prefer viewing stories by number of shares, because if a lot of my friends are talking about the same story, it’s probably something that should be on my radar, too. Tap on any story to read it in full on its original website. Besides your direct feed, you can dive into reading news from your friends, from friends of friends, news you may have missed, or check out some stories you’ve recently read. Nuzzel presents everything in a cleanly organized layout, so you can scroll through headlines to find the pieces that interest you the most. What I really love about Nuzzel is that it displays my friends’ comments about the article I’m reading. Because of the way Facebook and Twitter display posts, it’s possible that I would have missed what my friends had to say about this article had I not been using Nuzzel. And if you have something to add to the conversation, you can share the story and leave a comment straight from the app. So, if you’re a big social-media newshound, Nuzzel makes a perfect companion. Plus, you can’t go wrong with an adorable hedgehog icon. Nuzzel is a free app available for the iPhone and iPad.